Kerry Sabberton, Assistant Manager at our Thorpe Travel store in Norwich, spent an amazing three nights at one of Sardinia’s best resorts. With a whole host of activities available onsite, here is what she got up to. I am a fan of easyJet for short-haul flights and this one didn't disappoint - smooth ride, on time and friendly staff. Forte Village is an amazing resort complex; it is totally private and there is security on the entrance gates when you arrive. This resort is definitely for people wanting privacy and boasts several high-profile stars and footballers as regular guests. Once you arrive at the entrance, you are taken everywhere by golf buggies (although it is all walkable). The resort is made up of eight hotels, villas and suites ranging from four-star up to Luxury Gated Villas with their own chef and staff. We stayed in the Hotel Castello which is situated on the seafront with amazing sea views. This five-star hotel has 177 rooms and suites, it has its own private pool exclusively for the hotel's guests with views overlooking the sea, and the 4th and 5th floor Junior Suites have their own private lift and reception area. The restaurant exclusive to the Hotel Castello is the Cavalieri, where we had breakfast and evening meals on the first two days. The resort has a total of 21 restaurants, including Hell’s Kitchen and the Belvedere, which serves some of the most exclusive dishes from traditional Italian and regional cuisine. The nightlife at Forte Village is all focussed around the Piazza Luisa, which is an open-air stage surrounded by shops (Versace etc.). It caters to children and families early evening and there is live entertainment for the adults through until late. If you want more nightlife, there is a nightclub towards the edge of the resort that goes on until the early hours and has karaoke every other night. There is also a lot for children. They have Wonderworld, which incorporates Thomas the Tank Engine, Mario's Village, Barbie Activity Centre and Wonderlab. They also have dedicated swimming pools within Wonderworld and staff that are on hand to help, play and supervise. The trip itself was located within the Forte Village Resort and as there is so much to see and do that there is little need to go elsewhere. We had the chance to try anything and everything the resort has to offer - go-karting, bowling, Chelsea Football Academy, Boxing Academy and I could go on and on! One thing we all had included was a morning at the amazing Aquaforte Wellbeing Spa. The thalassotherapy course consists of six pure Sardinian seawater pools, each pool offering something different. It was an amazing experience and topped other thalassotherapy pools I have been in. We also had a tour of the Forte Arena as it was being set up for its next big event. The Arena is located just outside Forte Village Resort, a mere 130 metres stroll away, and can hold 5000 people. Previous acts who have performed here include Anastasia and Andrea Bocelli. It is surrounded by mountains on three sides, making the acoustics something not heard at other venues. I really enjoyed the thalassotherapy pools; they were something completely different to anything else I have done. This was followed by the amazing food, which comes in a close second in my list of highlights. I don't think the Forte Village should change a thing; it has everything down to a ‘T’, from the maintenance of the properties and public areas through to the management team who are there to meet you on arrival and wave goodbye when you leave. I would recommend this trip to anyone who has the budget. I would recommend Sardinia to all travellers, but this high-end accommodation option might not be for everyone. The sushi at Hell's Kitchen is amazing. 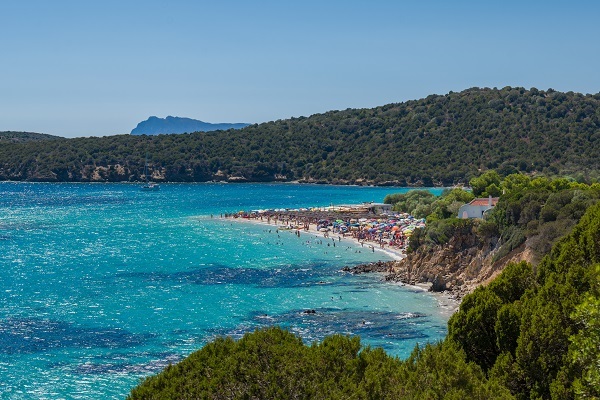 If you would like to plan your own luxury holiday on the sunshine island of Sardinia, our team is on hand to offer advice and help you book the holiday you deserve. Visit any of our travel agents in Christchurch, Westbourne, Dorchester, Lymington, Bournemouth and around East Anglia or call us today.